Yes, I had again 🙂 leftover rice in the refrigerator. Last week we finished our Vegetable Lasagne with some rice to soak up the sauce – which was really yummy. 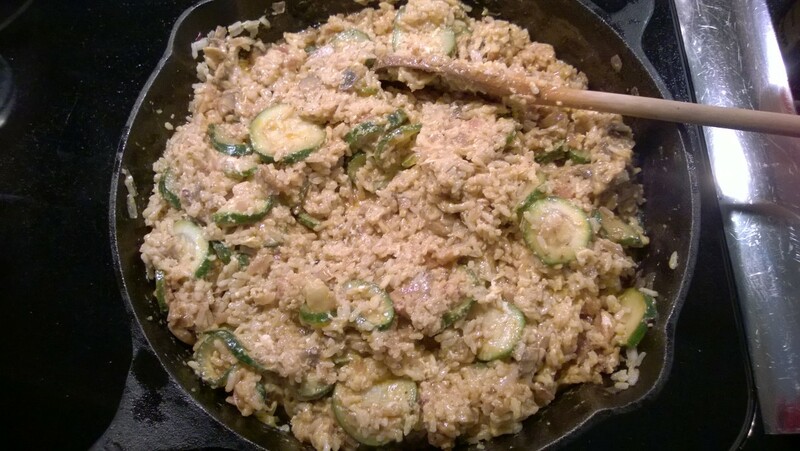 Now, I always make more rice than I need to, so I had some left over and – what do I do with it? Cut up 1 onion, a box of mushrooms and 2 zucchini – put in pan with olive oil and saute for 5 minutes until the vegetables shrink in size. Add the leftover rice and saute another 2 – 3 minutes. Add 4 eggs and mix well. Top with a cup of cheese. Put in oven at 375 for 20 minutes. Now for the Almost Paleo Zucchini Mushroom Risotto I skipped the oven part. I mixed the cheese under the rice/vegetables and added a little bit of soy sauce. Make sure the egg mixture is cooked and serve.